Tokyo, Japan – June 15, 2016 – LINE Corporation today announced that the popular puzzle game “LINE: Disney Tsum Tsum” for both Android and iOS has surpassed 60 million downloads worldwide. LINE: Disney Tsum Tsum is a casual puzzle game based on the popular Tsum Tsum plushes. The game is simple and fun, just connect three or more Tsum Tsum to pop them, and full of beloved Disney characters such as Mickey Mouse, Donald Duck, Winnie the Pooh, and more. After launching in Japan on Jan 29, 2014, the English version was released in 40 countries and regions around the world on Jul 1, 2014 and is now available in most regions globally. In the “App Annie 2015 Retrospective” report recently published by app market research institution App Annie, LINE: Disney Tsum Tsum was ranked 10th in the “Top Games of 2015: Worldwide iOS & Google Play Revenue” ranking, and 4th in Japan*1. 60 million downloads were achieved on May 19, 2016. 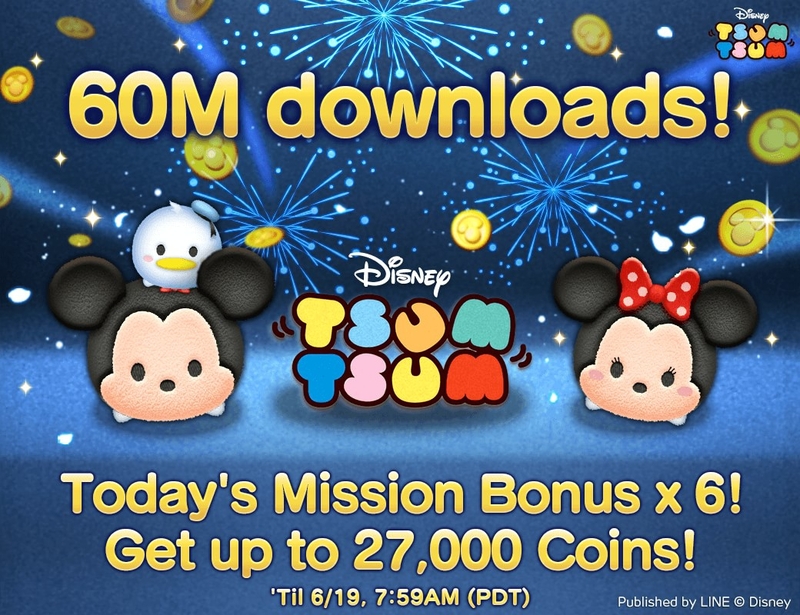 To celebrate 60 million worldwide downloads, LINE: Disney Tsum Tsum will provide a three day Today’s Mission Bonus. Today’s missions are updated once per day. Users can attempt three missions each day to earn up to 27,000 coins over three days during this event. Under its corporate mission “Closing the Distance,” LINE Corporation is developing a variety of engaging and innovative content and services in collaboration with global developers to bring customers even closer together. Copyright: © Disney © Disney/Pixar © 2016 & ™ Lucasfilm Ltd.
Android and Google Play are registered trademarks of Google Inc. IPhone, iTunes and App Store are registered trademarks of Apple Inc., registered in the U.S. and other countries. All other trademarks are the property of their respective owners. All information is true and accurate at the time of publication, and subject to change without notice.